Webers, one of the few eateries in Canada that isn’t Tim Hortons. After years of dropping hints — subtle things, such as legally changing my name to Al Gonquin — Ken Arthur and Steve McKee finally invited me to come along on one of their canoe trips to Algonquin Provincial Park. We left Ohio before daybreak on Labor Day and made it to the Canadian border by around 8:30 in the morning. The customs agent tried to trip us up by asking us our professions. In keeping with Ken and Steve’s canoe trip tradition, we stopped for lunch at Webers Charcoal Barbecued Hamburgers on Highway 11 in Orilla, Ontario. 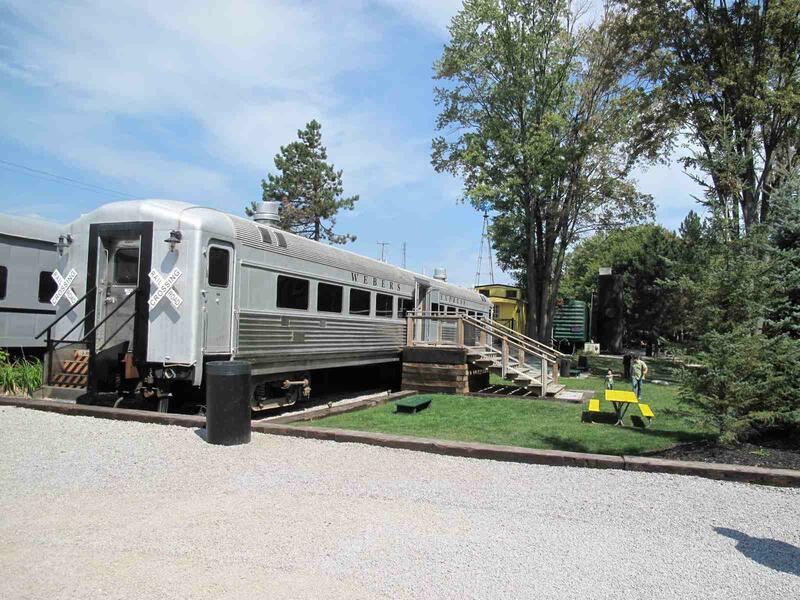 Webers is a Canadian landmark, known for its tasty burgers and old railroad cars, which are used for food storage, dining and restrooms. But not necessarily at the same time. Founded in 1963, the place became so popular, it created traffic headaches for southbound motorists wanting to turn left into the parking lot. So, after wrangling with the Ministry of Transportation, the owners acquired a section of pedestrian bridge from the old CN Tower in Toronto in 1983 and put it over the highway. That way, southbound motorist could park in the lot across the road and safely cross Highway 11. It’s the only privately owned bridge spanning an Ontario Highway. Apparently, one of the original employees Mike “The Key Man” McParland is still flipping burgers there. The call him that because he’s the only one with a set of keys to the place and he’s been there nearly 50 years because, if they fire him, they’re afraid he’ll take the keys with him. When we arrived at Webers, “American Woman” was blaring over the loudspeakers. At first we were concerned that there was some in-house rule that they could play only Canadian Music. It was hard to imagine enduring a steady diet of The Guess Who, Buffy Sainte-Marie and Gordon Lightfoot no matter how good the burgers were. However, that turned out not to be the case. They also played numbers by American artists. In fact, according to Webers Website, they offer CDs with collections of rock music from both sides of the border. By mid-afternoon, we arrived at the Algonquin check-in station. Unlike Ohio, where you can toss a canoe into any river and float for days till you run out of beer, at Algonquin you have to check in so they know who’s out there. That way, they can keep track of how many canoeists are eaten by bears. You are welcome to come up in June anytime and we will take a river adventure, try your hand at my cataraft and some whitewater..